In my comments on the National Park Service trails plan, in response to the recommendation that NPS join a proposed working group for trails to be initiated by the Washington Area Bicyclist Association, I said that while WABA should be commended for the idea, the proper course of action would be for the Metropolitan Washington Transportation Policy Board--the federally designated transportation planner for the region--to handle this function, that it should be official, rather than something nice for jurisdictions to participate in. 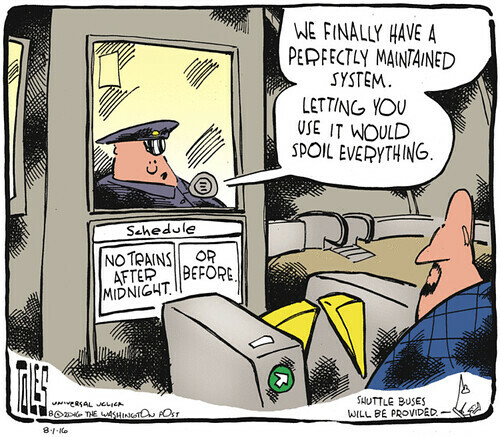 Tom Toles, editorial cartoonist for the Washington Post, cartoon on the proposal to cut Metrorail weekend service hours. As mentioned in the cited post, 24-hour weekend rail service starts on parts of the London Underground beginning August 19th. Photo: Corbis. The same goes for overnight transit service. I wrote about this a couple weeks ago ("Night and weekend transit/subway service: Metrorail edition") in response to the proposal by WMATA to close earlier on the weekends, including a short night on Sundays. 1. If Metrorail cuts back weekend hours, the WMATA transit agency should create a companion night owl bus service. 2. WMATA should create a Night Owl bus service along the route of the Metrorail system anyway. The proposed cutback on Metrorail hours should be the impetus for the creation of a system of overnight bus service for the metropolitan area. 3. Overnight service within the suburban jurisdictions would have to be provided, complementing the metropolitan-scale overnight bus service paralleling the Metrorail station network. 4. The overnight bus routes parallelling the Metrorail network should allow "flag stops" so that riders can get off the bus between Metrorail stations, so that they can alight closer to their final destination. 5. WMATA should provide Night Owl bus services for the region's airports, operating when Metrorail service is unavailable to National Airport and Dulles, and later than the current B30 service to BWI Airport, which ends between 10 pm and 11 pm most nights. This service could be staged from Union Station. 6. The Transportation Policy Board should create a Late Night Transportation Working Group to coordinate late night transit planning across the metropolitan area and across jurisdictional borders. A combined map of late night transit services should be created. In the interim, GGW published an op-ed, co-authored by the president of the Downtown DC Business Improvement District, in the Washington Post, "Ending Metro's late-night service is a bad deal for DC and the region." 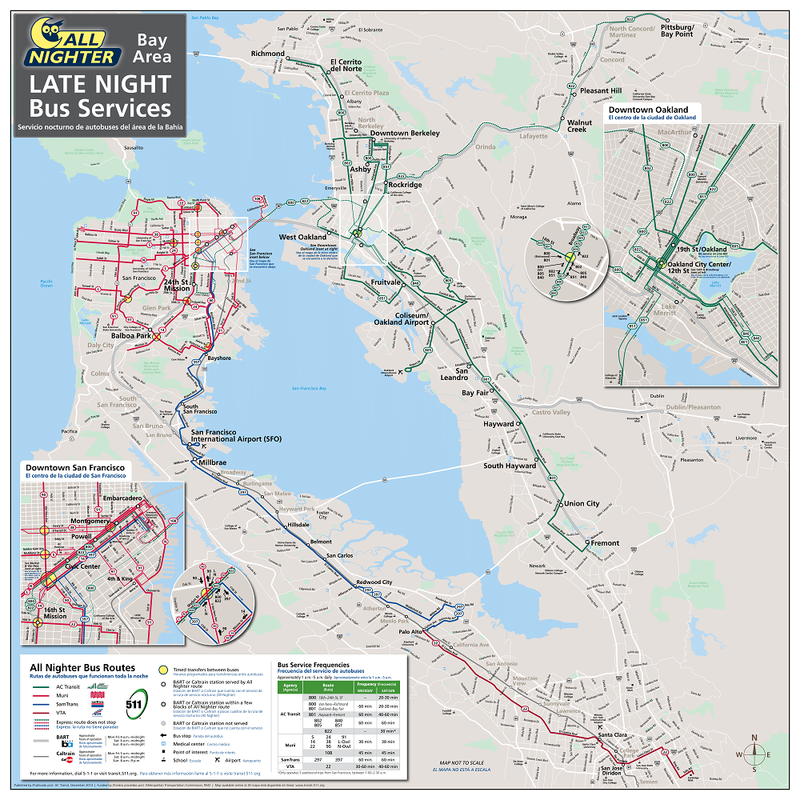 The East Bay Times has an article, "Expanded All Nighter bus service sees some gains, but demand still lagging," about the state of overnight transit service between the East Bay and San Francisco. BART has been helping to fund this service, and has to decide by the end of next year on whether or not to renew it. Separately, the SF MUNI system has an overnight Owl service which serves most of the city. They added two routes a few months ago. SFMTA is in the midst of a review of their services, and the Metropolitan Transportation Commission has convened a Late Night Transportation Working Group to bring the agencies together to coordinate services. Recently, they've joined in on a marketing effort to bring greater attention to the available services. 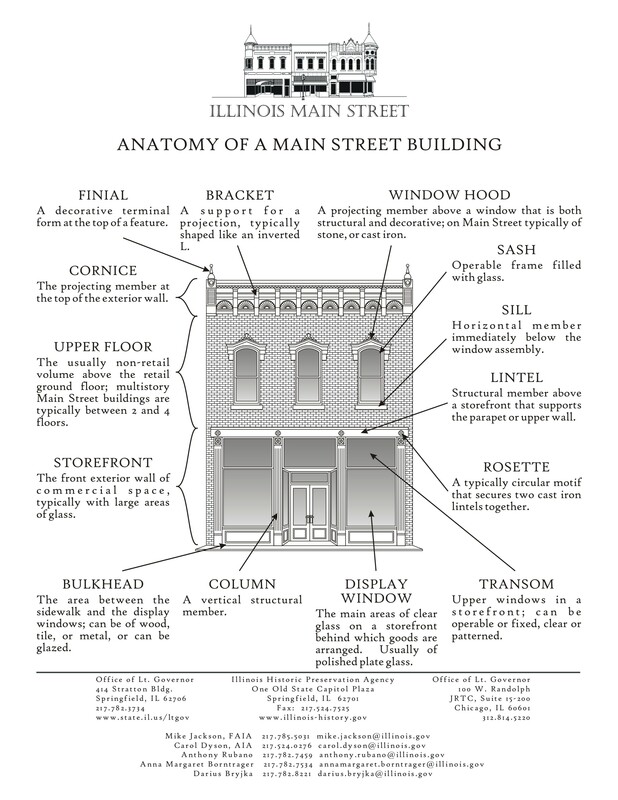 Among other elements of the campaign are some killer maps showing all the available services on one combined map. Late night transit service as an economic development strategy. 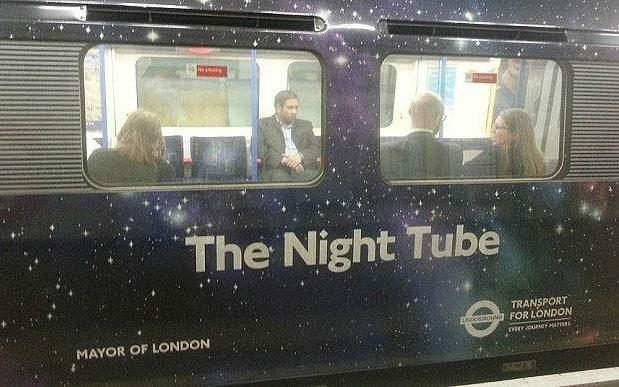 Both San Francisco (NightLifeSF: Resources to Support San Francisco's Nightlife and Entertainment Industry) and London consider late night transit service as an element of the night time economy. According to the Telegraph ("Night Tube start date revealed: 24-hour London Underground trains to begin in August"), night service will add £360 million to the local economy. Seattle/King County Metro looking at night bus service issues.